Make yourself at home in one of the 41 air-conditioned rooms featuring refrigerators and microwaves. Complimentary wireless Internet access keeps you connected, and cable programming is available for your entertainment. Private bathrooms with shower/tub combinations feature complimentary toiletries and hair dryers. Conveniences include desks and separate sitting areas, as well as phones with free local calls. 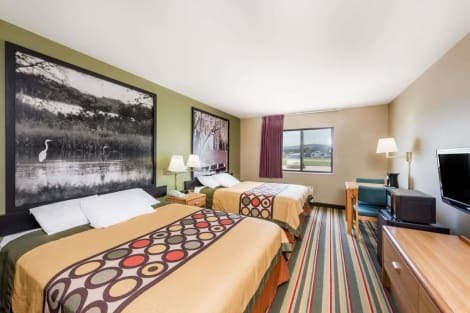 Located in Chanute, Super 8 by Wyndham Chanute is within a 10-minute drive of Maring Aquatic Center and Martin and Osa Johnson Safari Museum. This motel is 2.7 mi (4.3 km) from Katy Park and 23.1 mi (37.2 km) from Riverside Park. Featured amenities include a business center and a 24-hour front desk. Free self parking is available onsite.